AP PGECET Results 2015 Announced. Check AP PGECET 2015 Results from here. 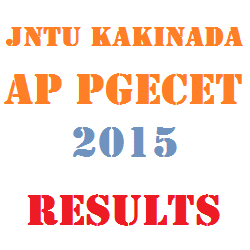 AP PGECET conducted by JNTU Kakinada, Andhra Pradesh PGECET 2015 Entrance held in May 2015. PGECET results scheduled to released on 11th June 2015. PGECET convener officially release the results on 16th this month. AP PGECET Results 2015 Announced. Check AP PGECET 2015 Results from here. AP PGECET Results 2015 were announced today i.e., on 11th June 2015. Total 45,099 candidates were appeared for the Common Entrance test and 37,555 candidates were got eligibility. The percentage of eligibility is 83.27. Total 23,788 Boys and 13,767 Girls were got eligibility in this Entrance Examination. AP PGECET conducted by JNTU Kakinada, Andhra Pradesh PGECET 2015 Entrance held in May 2015. PGECET results scheduled to released on 11th June 2015. PGECET convener officially release the results on 16th this month. The AP PGECET web counselling will be started from soon. Andhra Pradesh Post Graduate Engineering Common Entrance Test (AP PGECET) is AP State Level Common Entrance Test for admission into Regular PG Courses in Engineering, Technology, Architecture, Pharmacy (ME / M.Tech./ M.Pharmacy / M.Arch ), Graduate level Pharm-D (Post Baccalaureate) for the academic year 2015-2016 conducted by JNTU Kakinada on behalf of A.P. State Council of Higher Education (APSCHE), a statutory Body of the Government of A.P., Hyderabad. AP Post Graduate Engineering Common Entrance Test 2015 was conducted by Jawaharlal Nehru Technological University Kakinada. PGEC counselling will be held before the AP PGECET counselling. Students who appeared and qualified in GATE/GPAT will attend the counselling first after the AP PGECET qualified students can choose the remaining vacancies in all M.Tech / M.Pharmacy colleges in various courses.